From the first notes of Little Women’s score, with its haunting oboe and trembling strings, the poignancy that hints of tragedy and hardship is established. It’s an underlying feeling that remains, even as it is modulated: the strings swelling with confidence, before being overtaken by brass and accelerating into a kind of triumphant fanfare. Already, we begin to gauge the journey of these women’s lives. The music, and only the music, surges with feeling, opening up the gateway into an intimate exploration of not only the character’s emotional topography, but also our own. Like their name suggests, the March family are an intrepid bunch. Not heedless to the conventions of their time, but unwilling to be restrained by them, the family of four daughters barrel onward through the cold of the American Civil War. Raised solely by their Marmee (the stupendous Susan Sarandon) while their father is at war, she instills in them radically forward ideas for the time. The author was influenced by the Transcendental Movement, with its emphasis on individual self-reliance and independence, untrammelled by organised religion and politics. Strung together by the voiceovers of Jo, Armstrong fosters an intimacy that ties us emotionally to the March family and to their plights. While the expectation of marriage underpins their lives, for them, the pursuit of knowledge and the importance of familial love become a more defining aspect of their existence. Based on the 1868 novel by Louisa May Alcott, Armstrong brings to life the reality of a family living through the turmoil of war. But it’s more than that, as it follows a distinctly feminine journey. The sisters embody the pursuits of young women in the nineteenth century, as does their process of discovering – and fighting both against and for – their place in the world. The family’s ability to spark love and joy in the most bleak of times is brilliantly evoked by the cast. Alive with laughter and a visceral chemistry, the scenes burst with earthy colours, the closeness of bodies and the liveliness of rambunctious voices. This cast affinity – and by extension the characters – is immensely powerful in conveying the themes of family and love. A continual pull at our emotions, the score is as powerful as any of the most iconic, like Dr Zhivago or Lord of The Rings. The soundscape in general is also hugely important in evoking this sense of life and energy. The crackling of sausages at Christmas; the cheerful chords of a piano; the distinct voice of each sister singing; or the hush of conspiring voices, are all engaging details that speak just as loudly as dialogue itself. Not that any dialogue is wasted. Even whispers are layered clearly and subtly as clues or engines to the plot. The sage words of Marmee may well have fallen flat from the mouth of a lesser actor. Rather, the perfect casting is just another aspect that makes this film so undeniably special. While Jo may technically be the protagonist, we’re invested in every character, as each individual works gravitationally alongside the others. Trini Alvarado gracefully plays the eldest child, Meg. Beautiful, sensible, and dedicated to social mores, Meg grounds the more flighty Jo and Amy. The second oldest, Jo March, is fiercely portrayed by Winona Ryder, capturing her spirit solely in the undying sparkle of her eyes. Unable to be tamed by the restrictive expectations of her era, let alone by any individual, Jo passionately resolves herself on fulfilling the identity of a writer. Embodying the gentle Beth, Claire Danes breaks every viewer’s heart with her delicacy and quivering chin. Youngest of the children, Kirsten Dunst is Amy, the cherub of self-obsession – a bouncing ball of equal sunshine, vanity and naive romanticism. Even in her youth, Dunst is utterly believable, and so fully formed that she manages to endear and infuriate simultaneously. Yet, each character shines in their own right, and every actor so fully inhabits their role that, years later, their face remains iconically linked to their screen persona. The glorious Christian Bale should also be mentioned, as the – unrequited – Bonnie to Jo’s Clyde (yes, we’ll stick with that inversion). Playing Theodore (Teddy), he is the best friend who forces Jo to draw a line in the sand of her own freedom, and the subsequent heartthrob of many a young viewer. Somehow evading the stuffy language that can hinder some period pieces, Little Women has no false notes. The dialogue rolls off the tongue like a great contemporary Sorkin script. Their interactions are alive and unbridled, and while the family push against the limitations of their time, nothing feels dulled by the biased naivety of their era. The characters are real, feeling individuals, passionate in their convictions rather than cardboard cutouts or reflections of stereotypical restraint. Unlike many films in this historical genre, the underlying feeling is palpable; ringing in their laughter, or brimming in their rage, or dribbling in that one sloppy kiss. I’ll be honest when I say that I approached this review with utter trepidation. 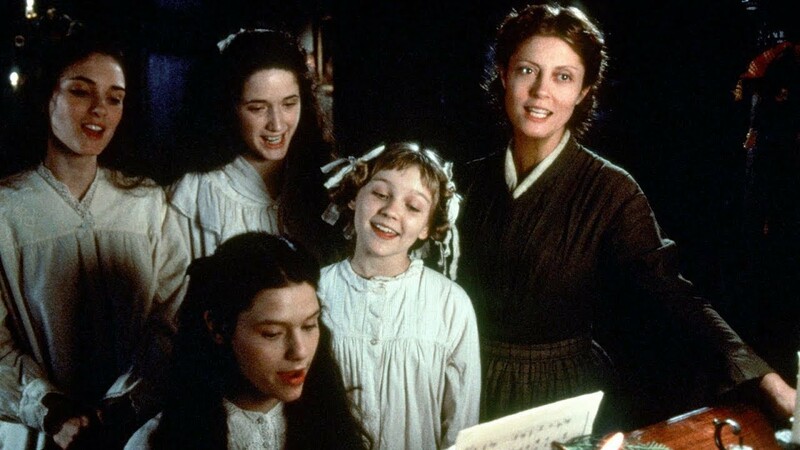 Armstrong’s Little Women holds an indelible place in my heart, tracing back to my early years of watching (and re-watching) this film. For me, every scene is threaded with nostalgia. It would be foolish to assume that I’m the only one with such a connection to this classic and, all things considered, I will say only this: no words can encompass the beauty of such a film, nor touch on the emotional and personal power it wields. Nevertheless, I felt it was a fitting final review for Popticon’s 52 Films By Women collection. Jo is a trailblazing heroine, a dream-snatcher who burns in her own right while, on a larger scale, Alcott herself was exploring hugely controversial ideas (and ideals) of a feminist slant. The bravery for her time, and the truth that still resonates now have become beacons of inspiration in the hands of modern women such as Armstrong. Flowing from life to fiction and transcending generation, we continue to rise on the backs of our sisters. As always, Rose Marel delivers a beautifully written and insightful review. I think I’ll have to watch this one again!